Call of Duty: Infinite Warfare's multiplayer mode will have more character than many of its predecessors. Players can join one of four Mission Teams to receive meta-objectives and evaluations from unique commanders as they progress through their competitive careers. It looks like a new trailer for the upcoming multiplayer beta introduces you to one of them: the leader of the JTF Wolverines, who likes to "keep it simple: kill or be killed". 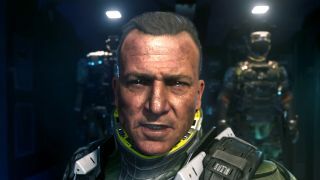 According to Activision and Infinity Ward, each commander will assign you missions and even talk about how well you carried them out. Rewards for climbing up the ranks of your Mission Team include new calling cards, emblems, and even some "prototype weapons" that are exclusive to members of that team. You also get the privilege of not being chewed out by Killy McCrewcut up there. The multiplayer beta for Call of Duty: Infinite Warfare will start this weekend exclusively on PS4, beginning on Friday at 10 am PDT / 6 pm BST and ending on Monday at the same time. PS4 and Xbox One players alike can join in for the second weekend, which will start on October 21 at 10 am PDT / 6 pm BST and conclude on October 24 at the same time. You can only get guaranteed access if you pre-order Infinite Warfare.